activities such as timber harvesting, shamba systems, charcoal burning and poles collection. This is threatening wildlife living in the forest. rivers that over the years have seen decreases in water volume due to loss of forest cover. This is leading to water conflicts among communities. farming which have caused massive soil erosion and infertility. forests. It draws on the strengths and contributions of science, civil society and business. through seminars and trainings undertaken every two months. 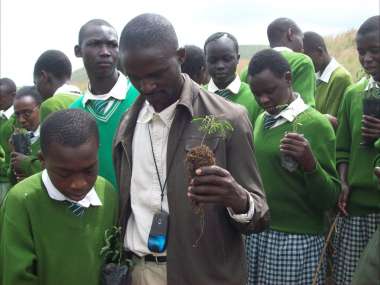 promoting growing moringa oleifera among the communities and school children in the area. beekeeping, horticulture and other income generating activities. windbreaks, firebreaks, alley cropping, forest gardens and contours farming). undertaking agro forestry technologies trainings. planting trees along riverbanks and water sources. The group is also protecting water catchment areas through tree plant along river banks. This photo shows an exposed river through cultivating near river banks. and Kenya’s Agricultural Research Institute are sources of knowledge and consultation. megalocarpus provide clean energy and alternatives to using wood, coal and fossil fuels. concerning this important miracle tree which has not yet been exploited. brain and nerves, and Proteins, the basic building blocks of all our body cells. basic building blocks of all our body cells. system of these school going children. separating dirt and clean water and will be used to clean their drinking water. tree products like leaves and pods, they will be able to improve their diets. planted in school and others shared among school going children to plant in their farms. (C)More than 10 schools in two districts will be involved with this project for the start. among school children and others planted in their school. and active groups or organization impacting the world on social and environmental issues. school going children and their parents.